Paris, April 16: Hundreds of millions of euros were pledged to help rebuild the partially destroyed Notre Dame Cathedral, the 850-year-old Unesco world heritage, as flames that ripped through the Paris landmark were extinguished on Tuesday. The fire was extinguished some 15 hours after it began on Monday evening, but emergency services said they were still working to douse the hot spots. "The fire has been extinguished," fire services spokesperson Gabriel Plus said, adding that around 100 fire-fighters were still at the scene making sure that embers and hot spots were under control and "surveying the movement of structures and extinguishing smouldering residues". 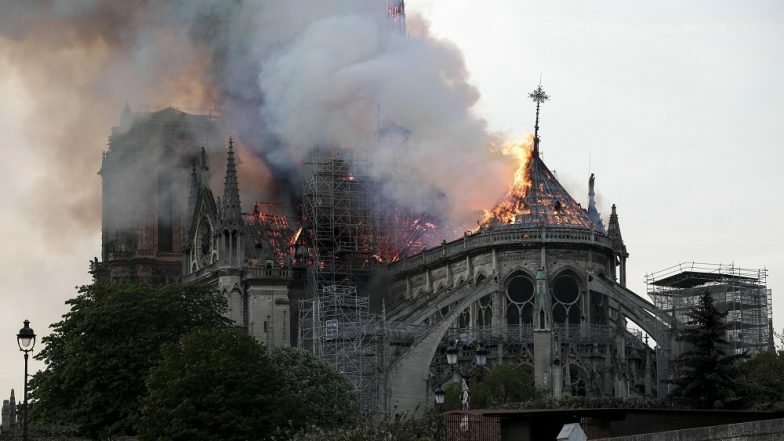 The blaze ravaged the iconic building's roof and caused the collapse of the Cathedral's spectacular Gothic spire and the destruction of its roof structure. However, the fire-fighters who worked through the night managed to save the Paris landmark's main stone structure, including its two towers. As the cause of the fire was not clear, the police began questioning workers who were carrying out renovations at the cathedral. The Paris prosecutor's office opened an inquiry into "involuntary destruction by fire", indicating they believe the cause of the blaze was accidental rather than criminal, the Guardian reported. Notre-Dame Cathedral in Paris Goes up in Flames, Know the History And Facts of Famous French Tourist Attraction (Watch Pics and Videos). While French President Emmanuel Macron vowed to reconstruct the historic building, two French business magnates pledged about 300 million euros. Offers of help with the reconstruction also poured in from around the globe, with European Council President Donald Tusk calling on EU member states to rally around. "I'd like to say words of comfort and solidarity with the French nation, also as a citizen of Gdansk, 90 per cent destroyed and burnt, later rebuilt," said Tusk. "You will also rebuild your cathedral," he added, calling on all 28 member states of the EU "to take part in this task." Macron described the blaze as a "terrible tragedy" and pledged to raise funds worldwide. "Notre Dame is our history, our literature, part of our psyche, the place of all our great events, our epidemics, our wars, our liberations, the epicentre of our lives. I solemnly say tonight: we will rebuild it together." Emergency teams managed to rescue valuable artwork and religious items from the blaze, including what is said to be the crown of thorns worn by Jesus before his crucifixion. A tunic King Louis IX is said to have worn when he brought the crown of thorns to Paris was also saved. The works of art that sustained smoke damage were being taken to the Louvre where they would be dried out, restored and stored. Paris Mayor Anne Hidalgo said the city would make 50 million euros available and propose holding an international donors' conference to coordinate the pledges to restore the building. French billionaire Bernard Arnault announced that he and the LVMH luxury conglomerate he controls would donate 200 million euros for the reconstruction efforts. The pledge came after the rival fashion group Kering, founded by the billionaire Francois Pinault, offered 100 million euros to help "completely rebuild Notre Dame". Russian President Vladimir Putin sent a message to Macron, offering Russian experts to help in the restoration project. The UN's Paris-based cultural agency Unesco also promised to stand "at France's side" to restore the site. "We are in contact with experts and ready to dispatch an urgent mission to evaluate the damage," Unesco's Secretary General Audrey Azoulay said. Britain's Queen Elizabeth expressed her "deep sadness" and sent a message of support to the people of France in the wake of the fire. UK Ambassador to France Ed Llewellyn said the British government was also looking into what it can do to help. Chinese President Xi Jinping said: "China firmly believes that restoration will be carried out smoothly and Notre Dame will regain her splendour under the efforts of the French people and with support from the international community." US President Donald Trump termed it a "terrible, terrible fire", while German Chancellor Angela Merkel called the Notre Dame a "symbol of French and European culture".